Night Shade Message Boards: Warning for subscribers! Someone got ahold of our mailing list and has been sending out subscription solicitations that look like renewal notices. A subscriber with a lifetime sub forwarded one to us---it's from Magazine Payment Services, PO Box 1296, Sausalito, CA 94966. Please don't be deceived. 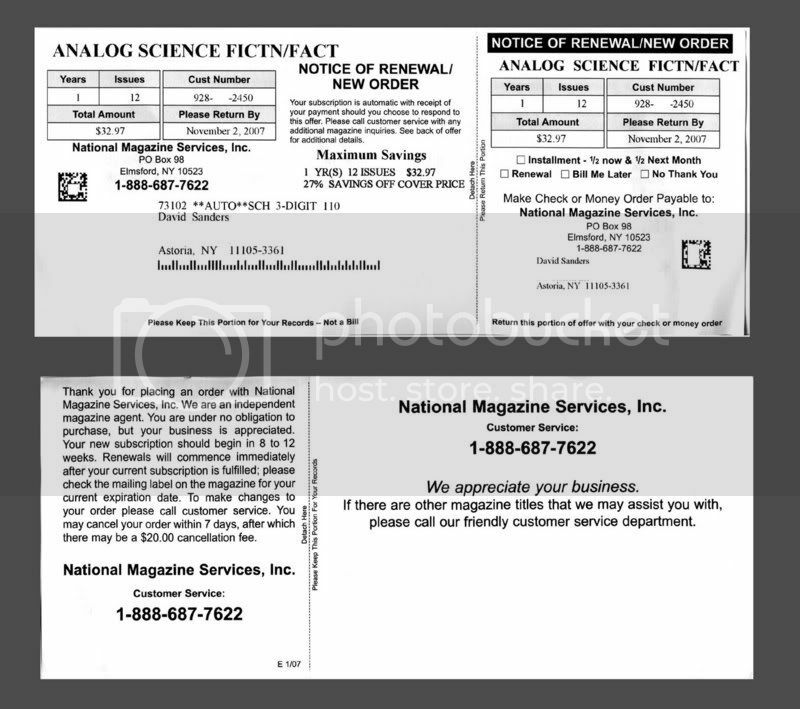 A real F&SF renewal notice will have our address on it (that's PO Box 3447, Hoboken, NJ 07030). These fake solicitations have disclaimer language in small type on the back. If you get a deceptive notice, ignore it (or if you want to file a complaint with the Better Business Bureau, far be it for me to stop you; in fact, here's the BBB page for Magazine Payment Services: http://www.goldengatebbb.org/commonreport.html?bid=59257). If you're in doubt, feel free to contact us through our Website or by mail at PO Box 3447, Hoboken, NJ 07030. Ack! I just got that and was about to send in money. Thanks for the warning. It's odd. When I click the BBB button to file a complaint, I'm only given options concerning 1. employment practices, 2. civil rights violations, or 3. discrimination. So do you get an actual subscription out of this if people send them money, or is it just a straight scam where they keep the money people think they're sending to you? And isn't this some kind of mail fraud in either case? Don, you might need to call the BBB. I don't know the particulars. Charlie, since I've never actually dealt with this company, I don't know if they fill orders or not. When I tried calling today, I was put on infinite hold. Two months ago, we had a subscriber who sent money in response to a similar solicitation. The form looked the same, but the company was in Las Vegas. After we figured out why we had no record of her subscription, she called the company and spoke with a very helpful representative who apologized for the error and said they would arrange so that the subscriber was compensated with a two-year subscription instead of one-year. That was late August. We still haven't received a subscription order for this woman who sent the check. This stimulates my dormant crime writer genes. How did they get hold of your subscriber list, Gordon? What a few will do to steal a buck...very sorry to hear that folk have been burned. I wish I knew, Matt. Thank you for this warning. I was pretty sure my subscription had quite a while to run, but I hadn't gotten around to checking on it yet. Now you've saved me the trouble! I originally subscribed to F&SF in about 1992 through a young person I knew who was raising money for a high school band. Perhaps the company that processed those subscriptions is the source of the leak. Should you send out an insert with your next subscription mailing to warn everyone about this? You can always find your subscription's expiration date on your mailing label. It has to be there. The companies that typically sell subscriptions for school fundraisers---QSP, Inc. and NCS---don't have access to our whole mailing list. So I don't see how they could have leaked our mailing list. An insert with the next subscription mailing is a good idea...except that it won't reach the people whose subscriptions aren't coming due soon! The first person who brought this problem to our attention has a lifetime subscription. That means that he doesn't get renewal mailings from us. Why not put a house ad in the next issue? If the subscriber list is on a internet accessible computer isn't it possibly a hack? Who prints the labels? If it's a company that's processing multiple magazine subscriptions then that could be a point of entry. Either a hack or perhaps an employee being paid to deliver the subscriber lists. I DID mean to say "Put an insert in the next issue that goes out to subscribers." I apologize for the confusion. My last issue of F&SF is downstairs in "the archive", and I hadn't gone down to look at the subscription sticker yet. Now I don't have to. I am all caught up on my F&SF and "Years Best SF" reading, so I'm looking forward to the next issue. I accidently picked up "The Hunt for Red October" from my bookshelf because I didn't have any short stories to read. Big mistake -- I don't have TIME to spend all day reading novels, but thats what I do if I pick one up. If I don't have short stories upstairs when I take F&SF down, I should bring an old one back up. I'm doing more legwork tracking down MPS. If you received one of these deceptive subscription forms, I'd appreciate it if you'd send it to us at F&SF, PO Box 3447, Hoboken, NJ 07030. One subscriber emailed us a scan of the form today, which was most welcome. Do you still need examples of the forms? I just got a letter from MPS and it's still unopened. Thanks, Christine, but I don't think so. I've sent a bunch off to our list manager. Hope they're brought to justice! Latest update: most subscribers have been smart enough not to fall for this scam, it seems, but I'm dreading the first report we get of someone who did fall prey to it. At World Fantasy Con, I got a good lead as to where the leak of our mailing list probably occurred. We're looking into it now. I received one of these in the last couple weeks, but only got around to looking at it this weekend; Andrew Grossman at F&SF was good enough to confirm it's a scam. Thanks for taking the incident seriously; I realize dealing with this sort of stuff is no fun. I am just disappointed the solicitation didn't come with a postage-paid envelope. Magazine Payment Services could have paid for me to send them a..."present." Send the "present" anyway, Geoff. It's a thought...although I've known too many mailcarriers over the years to want to deliberately cause trouble, even for my own snarky edification. But I have followed up with the BBB. "We found the content and theme of your offer compelling, but regret to inform you that your subscription/renewal request does not meet our needs at this time. "The quality of your material - particularly the failure to clarify the protagonist's motivation and the blatant attempts to deceive the reader throughout the entire piece - suggest you may benefit from deeper study of the genre. Or, more bluntly, that you should strongly consider another vocation altogether. "Please do not re-submit this piece, nor submit other material for consideration in the future. We believe we can speak for the entire industry in fervently expressing the hope that our paths never again cross. We're still getting problem renewals caused by MPS. If anyone here has sent them a check, please let us know right away. Gordon, might it be a good idea (if you haven't done so already) to send a letter to everyone on your subscriber list warning about this? Posting on this forum is a good start, but won't reach everyone. Sticking inserts into the magazine issues is also good, but some people might not read every issue in a timely manner. We got our first letter today from somone who sent a renewal payment to MPS. No sign yet of the payment here, but even the most reputable magazine agency isn't always going to fill an order in two weeks. Incidentally, I've heard from other magazines that this firm is being investigated for mail fraud. What happens if it is mail fraud? Do the defrauded subscribers still get their subscription? Do you recover any of the money? Or do you and the subscriber both lose? (C) You and the subscriber both lose. If a check is sent to Magazine Payment Services and our share of it never arrives, there's no subscription for us to honor. In a case such as this, it's up to the person who sent the check to track it down and to see that it is honored. We provide what assistance we can. PBE: Publishers Billing Exchange, Inc.
By the way, we've heard from a couple of people now who sent money to Magazine Payment Services in response to their mailing. For anyone who did so, the first step you should take is immediately write to them and request a full refund. It's best if you send the letter by certified mail. Got one from BPE. You need it for anything? On the BBB, what should we say? They have not, in fact, committed any behavior that has harmed me in any way. If the packaging or marketing is deceptive, you can report that. For instance, do they indicate that their offer is a subscription renewal? Your sub doesn't expire until the Feb. 2010 issue---you shouldn't be getting anything that even uses the word "renewal" unless it's some sort of a special early offer. Is it possible that they have both the subscriber's list AND the expiration dates? If they only send renewals to people whose subscriptions run out in a couple years, they could potentially cash the checks and move on long before either you or the subscriber noticed anything wrong. Charlie, I don't know about this Publishers Billing Exchange, but MPS mailed forms to subscribers with lifetime subs, so I don't think they have the renewal dates. I think they're just mailing to all the names they've got. What is the renewal date on a lifetime sub? Must be, otherwise wouldn't it be a snub to Hindus? I believe I received a so-called "renewal form" from one of these companies the other day. I don't have it handy as I'm typing this, but I did save it in case it's needed. I wasn't fooled because I have already renewed through 2009, so receiving a one-year renewal notice now didn't make sense. Besides, it looked nothing like the normal renewal forms I receive from you. Just to follow up, the mail I received was from Publishers Billing Exchange. Someone else emailed us and said they got the same thing, called the phone number on it, and got Magazine Payment Service's answering message. I just got one Jan.9th from Readers Payment Service (RPS) PO Box 61001, Reno, NV 89506. Their customer service toll free is 866-732-5851. They are asking $33.99 for an 11 mo. sub. I rarely get sub renewals for other magazines from 3rd party companies--it is amazing to me the diverse number of companies coming out of the woodwork to offer subs to F&SF! it is amazing to me the diverse number of companies coming out of the woodwork to offer subs to F&SF! Makes me think that they're all related somehow. I've also received one from RPS last week "due" by Jan. 22. Do you need any of the info on it? Yes, if someone could send us one of those pieces from RPS, we'll add it to the information we've got on our Website. Thanks. Here's the latest info: on Feb. 6, we received a slew of orders (via an agency) that turned out to be the orders that MPS received through their dubious solicitation. It appears that they took more than three months to fulfill some of these orders, and the rates they charged were not authorized by us, but evidently they did fulfill the orders ultimately. I finally got one of those Readers Payment Service invoices. They operate out of PO Box 61001, Reno, NV 89506. I don't have the back of their invoice, but the front has a bogus account number on it (any account number we use will match what's on the mailing label of your sub copies) and the rate is incorrect. I got one in the mail today myself. The back is just their toll-free number and a somewhat odd disclaimer (orders can be cancelled if the toll-free number is called within 168 hours, for a $20 processing fee). I'll send the whole thing to you if you want. Yes, that would be great if you'd drop it in the mail. Thanks. That disclaimer on the back might be odd, but if it's like the other ones I've seen, it makes prosecuting them very difficult. Hi, Gordon. I just noticed this thread yesterday and last night mentioned the scam to my wife, who manages all the household finances and pays the bills. She'd just arranged all of my magazine subscription payments into a file so we could submit our 2006 taxes and, wouldn't you know it, we got hit with the same scam that Charles Finlay describes above. If it had been me -- the procrastinator -- paying the bills, the scam bill never would've been paid, but Dara is my opposite when it comes to things like that, so she paid it as soon as she got it (last fall). Turns out she'd paid for an actual F&SF subscription renewal a few months earlier, but I get several SF magazines in the mail, so she didn't notice. She's making a copy of the fake bill for me, and I'll either mail it to you or fax it to you. It's exactly what Charles Finlay describes. Dara is really pissed off and would like to participate in any group action taken against this company (or file her own mail fraud complaint). They sent me a solicitation too. Here's a scan of it. Whoa, sorry the scans are so big. When I get a chance, I'll try to replace them with smaller scans. Andy, it looks like the sub that Dara ordered came through. Gordon, Dara paid twice last fall -- once to you and once to the a--holes in La Habra, California. Are you saying that both subscription payments reached you, or only one did? Me too. I sort of remembered discussion about a renewal scam and checked with the publisher. However, had I not just renewed my subscription, I might have been taken in. BTW, this is clearly fraud. I intend to notify the postal inspectors; using the mail to conduct fraud is a federal crime. Their offer is not authorized by us any more than the others were. We've been in touch with other magazines that have been victimized by these firms. I don't know if it's true, but I hear that these companies are all linked through a larger operation. If you check out these companies, most of them are not in business for long. The Publishers Billing Exchange has morphed into Publishers Billing Agency. Same form as Gordon's scan above, different contact details. PBA, PO Box 250, Capitola CA 95010. 1-800-834-4181. I am afraid I paid one of these scams in 2006. I am appalled, but the irony of Gordon's notice made my day. 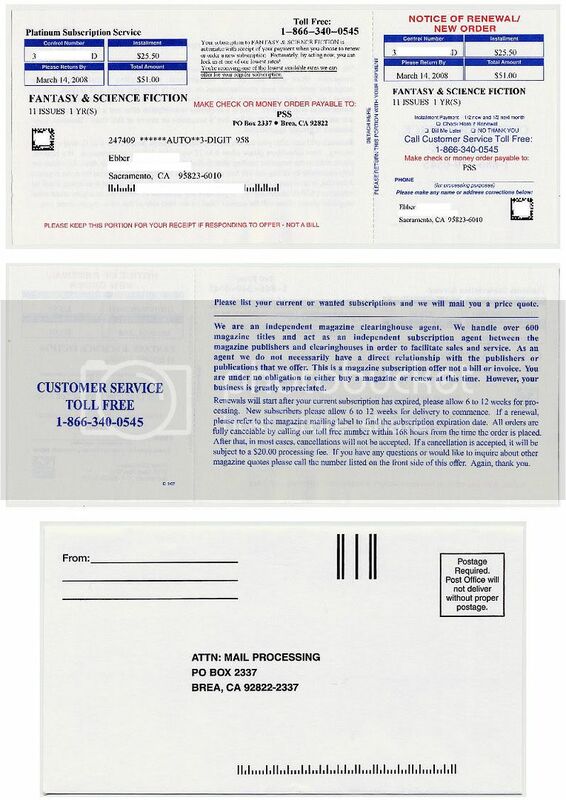 I just received one of these bogus renewal offers from Publisher's Billing Exchange, Inc., PO Box 7004, La Habra, CA 90632. Thanks to this message board, I was not fooled! Plus if I recall correctly, I always renew my FSF subscription when I receive the renewal offer directly from FSF and no one else. just got one myself from PBA. was going to let f&sf know when i saw the forum and checked it out. they even charge a little more. checked my address label and found i still have 2 years left. guess i don't need to contact the mag directly now. take care, all. We've heard from a few people who tried calling the 866 phone number listed on these deceptive notices. It sounds like you shouldn't bother. No one answers. I tried looking online for another phone number for these companies, but no luck. They list even more of these deceptive companies than the ones who have mailed to our list. Notice how all the mailings follow the same format and pattern, down to the similar-sounding company names. I just received the exact renewal notice from PBE that GVG scanned above - as well as my April issue of F&SF. I was actually going to post a message because I was concerned that I might have renewed my subscription through one of these bogus agencies. I did not receive my March 2007 issue of F&SF and after reading this post, I started to get concerned. Since I did get my April issue, I'm assuming my subscription is valid, but I would like to be sure. How do I go about checking on my subscription? Should I call or send in a letter? And what do I do if I didn't receive my March 2007 issue? For Gordon: Since I have the exact renewal notice that you scanned Gordon, do you want/need me to mail it in to you? As a side note, while I was eating my lunch I decided to give the 866 number a call, and I actually got a pre-recorded message that explained to me that if the notice has the phrase "Notice of Renewal / New Order" on the form in red in the top right corner, then I don't need to fill it out. I don't know if that's something that they added because of recent events, but it seems to me that that information should have been provided with the initial mailing, and that now they may be trying to cover their arse. The message also informed me that they are open 9am to 5pm PST, and that they are closed for lunch from noon to 1pm PST. I called earlier today when it would have been 11:15am PST, and was on hold for 45 minutes waiting for someone to pick up. It didn't bother me, I was reading and eating lunch during all of it. As for the April 2007 issue of F&SF - it has been in my hands for less than 24 hours now, and I have already finished it. I loved "Titanium Mike" & "Memorare". Funny, like Edward, my "renewal notice" from PBE arrived with my April Issue also yesterday. Harlan Ellison's "Driving in the Spikes" offers much advice for such situations, far more elegant than breaking knee caps. I tried calling this phone number and got through---but it's just a pre-recorded message with no chance to speak with anyone or to leave a message. Mr. Brady, there's no need for you to forward the piece you received to us. If you're the Edward Brady at Finnigan Ave., your sub is good through the May 2008 issue. (The expiration date for your sub should be on the mailing label for your issue.) If your March issue doesn't show up in a day or two, let us know via the "Contact Us" form on our Website and we'll take care of it. Thank you for getting back to me about my subscription, I appreciate that. Also, thanks for the heads up about the March issue. Today we learned of a new wrinkle: a subscriber in Texas says she received phone calls from Readers Payment Services pushing her to take a four-year subscription and pay in installments. Has anyone else received phone calls soliciting subscriptions to F&SF? Also, we're asking anyone who sent money in response to one of these deceptive subscription offers to send or email us a copy of the cashed check. It will help us track down the root of the problem. Thanks. It looks like the scammer has bases in a number of cities; the LaHabra PO box is in Southern California; Capitola is a beach city next to Santa Cruz in Northern California and 50 miles from Sausalito, and Reno Nevada is not all that far off. Gives me the feeling that at least one perp lives in the Bay Area and is behind all the local addresses. Also, Eli Journals/Eli Research/New Hill all seem connected with them on that phone number but are on the East Coast. Since many magazines are being scammed by these crooks, perhaps publishers should band together, share expenses to hire a detective, and catch the scammers. Thank you, Bert. I haven't read that whole long thread yet, but I don't think Eli Journals are connected to the people sending out forms to F&SF subscribers. Magazine Payment Services. I almost wrote these guys a check last week. Sheesh. I feel your pain, Jack. I had one of the Publishers Billing Exchange variety in my "to pay" pile of bills. At least I'm a *procrastinating* sucker. Three years back I got a big rent increase and had to trim some "luxury" spending to make up the difference...one of the fun things that had to go was all my magazine subscriptions. The only one I kept was F&SF, there was no way I was giving THAT up. Giving up the multiple subscriptions was probably for the best because I am sure that if I kept them all I would have by now paid this scammer for a bogus one. One of our subscribers says she got another mailing from PBA, this one soliciting subscriptions for ASIMOV'S. Thanks, Sheila. The more people spread the word about these scams, the better. We keep hearing from victims of the deceptive mailings. I got one of these for F&SF and just ignored it (being familiar with this thread). I've been getting them for various magazines for several years, but didn't quite realize it was a scam, and actually sent one in with a payment, the first time I got one for Macworld. Thanks for revealing them as a scam. The BBB lists them as being at #354, not #345, so I wondered if 1819 Polk was a private mail box . . . and yes, there appears to be a UPS store at 1819 Polk. Today one of our subscribers says he got another notice from PBE, only this one was for ANALOG. So it sounds like they're using our mailing list now to solicit subs ("renewals") for other SF magazines. Another subscriber this week said he got one of these notices from Readers Payment Services, so I thought I'd better warn everyone that there seems to be another round of these misleading notices in the mail. There's definitely another round of these deceptive pieces in the mail---we heard from two subscribers today who received them. Please don't be deceived. Subscribers are continuing to receive these deceptive mail pieces, so I thought I'd better bump up this thread again. I'll try to get a scan of the mail piece posted here. I think I got that very same one yesterday. Threw it in the trash, of course. Thank you for posting a photo of the mail piece. It's the same one I received. Folks, by any other name this is mail fraud which is a felony. The USPS takes a very dim view of this sort of thing and will investigate and prosecute the offenders. When you get such a "subscription renewal" form you should take it to your local post awful and tell the clerk that this is mail fraud. He or she will immediately send it to the postal inspectors who will do the rest. The more they get the more seriously they will take it. Gordon, you are welcome! Thanks for all your hard work on F&SF. Ira Stoller "local post awful" is hilarious and SO TRUE, especially my branch in Astoria, Queens...where long lines of customers are lucky if more than two of the seven windows are open for business. The windows are behind bullet-proof glass, most likely to protect employees from angry customers. I am surprised that no one at the branch has "gone postal" in the recent past. Gordon: While I only subscribed to F&SF in the last few minutes--honest truth, you should see the payment going through your paypal system as I type this--you should know that these scams are also being done by phone. I've received several phone calls over the last year trying to get me to renew my Asimov's subscription. Trick is, they never know my subscriptions actual expiration date. This scam has been discussed on the Asimov's forum, so I'm obviously not the only one receiving these calls. Are you having any problems with F&SF subscribers receiving calls like this? If we've had trouble with telephone solicitations, no one has complained to us about it. Incidentally, we recently had a breakthrough in proving how our mailing list was stolen and who did it. I can't say anything more, but I think that particular hole is plugged now. Good. Uh... You guys aren't tight with Tony Soprano or anything like that, right? Gordon, it is still going on: yesterday 11/14/07, I received one from "Readers Payment Services" --- the one in Reno. THEY WANT $51 FOR ONE YEAR!! Fortunately, I had renewed at your website less than two weeks ago for $32.97. YIKES! Please let me know if you need a scan of this. And thanks for warning us!! I got a phone call (cold call) today from a nice lady who represented that she was calling on behalf of the "Viking Magazine Service". We discussed some of the 400 magazines they could provide subscriptions to, but as there was no way for me to call her back, I concluded it was a scam of some sort. Always ask, 'Is there some way I can call you back', and if they do not provide a phone number, I would say it is definitely a scam. Buyer Be Aware. We haven't authorized anyone to solicit subscriptions to F&SF via cold calls. Thanks for posting that one. I've seen plenty that used the same color scheme, but I'm not sure I've seen one before that's from PDS in Brea, California. Just heard from another subscriber who got one this week. Please don't be deceived by these notices. I just got one from "Readers Payment Service" in Reno, NV, In the fine print, it tells me that my "subscription" through them will go into effect when my real sub (they didn't call it that) runs out. Is there really *no* way to shut these crooks down? That fine print goes a long way in protecting them. Also, this thread has been running for 14 months. Take a look at how many different companies have sent out these deceptive mailings in that time. Each one of those companies is incorporated, some in different states. I have more information about efforts to shut them down, but I don't feel comfortable posting the information on a public forum. Let it suffice to say that the more complaints filed against them, the better. Did you ever read Ann Crispin's account of pursuing scammer Martha Ivery? The climax is here and I think you can link to older pieces of it: http://accrispin.blogspot.com/2006/12/ac-crispin-68-martha-iverys-sentencing_01. html. Of course you're right, Gordon. 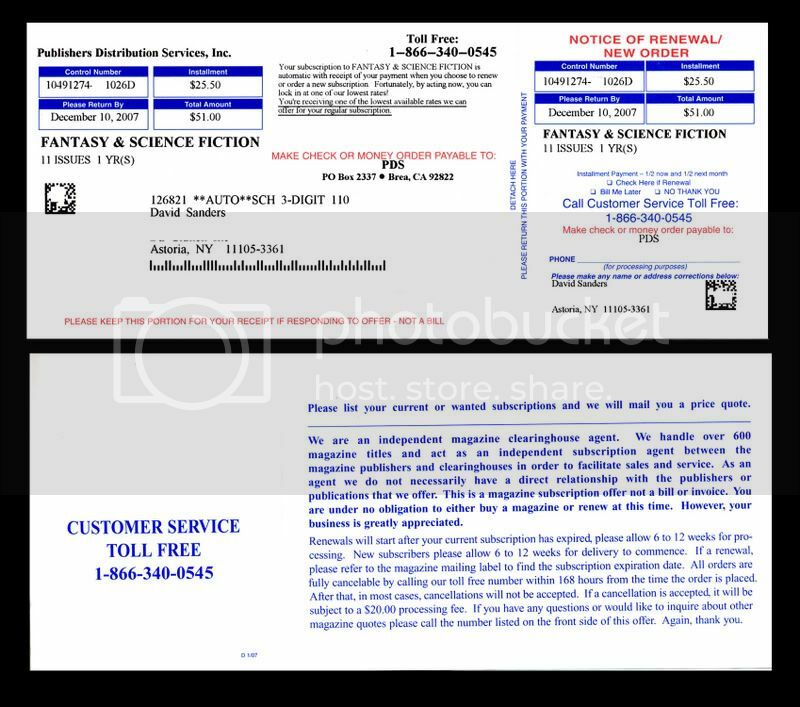 I myself have received at least three of these scam "renewals" for F&SF, and one for Asimov's -- to which magazine I didn't have a subscription. I'll send a note to the BBB. Another subscriber received one recently, so I thought I'd better bump up this thread again. These deceptive solicitations are still making the rounds. Please don't confuse them with a renewal notice sent by us. Gordon: Just as an FYI, in case it's of any use to you in helping to combat these scammers. Today I recieved "renewal notices" from Publishers Billing Exchange at the La Habra, CA address for Civil War Times & America's Civil War, both of which I had let my subscription to lapse about a year ago. It's not just the F & SF market that are being targetted. Don't know if it's of any use to you in case you might want to throw in with other publications to do a "group whacking" of these scammers, but thought you might like to know. Oh yeah, BTW, your warnings to F&SF subscribers about these people helped me to identify what the deal was with these so-called renewal notices. As soon as I opened the envelopes, I thought WTF. And then I thought: wait a minute, this reminds me of...sure enough it was the exact same "renewal notice" you had posted to this thread for Publishers Billing Exchange, just the names were changed to the other publications, and with equally questionable (as I recall the rates I had paid a couple of years ago) "low subscription rates". Thank you, Lee. We've been in touch with several other companies that have been victimized by PBE and other companies. (You'll notice a link to AUTOWEEK above.) I don't think we've been in touch with the Civil War magazines, though. I got one from "Platinum" too -- also known as Publishers Distribution Services. And I am a lifetime subscriber! I've reported it on the Postal Inspector site, but I'm not sure they can do anything, as I didn't send any money. Count me as another solicitee of "Platinum Subscription Service." The say their phone number is 1-866-340-0545, and they're in Brea, California. I called the 866 number. Phone was answered promptly; with the "control number" I received, they promised to remove me from their mailing lists. They claimed their relationship is with the clearinghouses, not the publishers. $51 for a year. It's a good thing I saw it, because my wife had opened it and planned on paying it. I called them, got a machine, and left an unpleasant message. I refrained from profanity, but did wish "crotch lice" on them. I kind of feel bad about that part. I shouldn't be wishing ill against others. Besides, why waste perfectly good crotch lice on someone so low? We're getting more of these deceptive forms now, so I thought I should bump this thread up again. Which is the same company that solicited Kevin M (who posted on 2/28/08). The offer is for $51.00 for one year, which means the phrase "Maximum Savings" listed on the form is misleading, since our standard one-year rate is $34.97. Please don't be deceived by this offer. It is not authorized by us. I received the same "NOTICE OF RENEWAL/NEW ORDER" on 4/12/08. Unfortunately, these same people appear to have appropriated other mailing lists. I purchase a gift subscription for a relative, to the Biblical Archaeology Review, and I received a renewal/new order for that subscription as well. Looks exactly like the fake renewal for F&SF, but this is the first time I've received one for the other publication. I'll let the other publisher know, and will send these to the BBB with a complaint. If you do an online search, Melissar, you'll find a bunch of magazines that have been victimized by these rogue agents. We've been in touch with several of them. All of us agree that the most important thing for us to do is to educate our subscribers about these rogues. We've gotten several reports now of an outfit called Publishers Periodical Service Las Vegas, NV, that is also sending out unauthorized offers to our subscribers. Gordon, I just renewed my sub...the return envelope was addressed to Spilogale in Hoboken. I scrutinized the form when i got it, however, just in case. This thread has me paranoid and I am now suspicious of all subscription offers no matter what publication is offering them! Given how many of these deceptive or dodgy offers are around nowadays, it's probably good that you're scrutinizing all offers closely now. I've been doing the same. This company shouldn't be confused with Periodical Publishers' Service Bureau, Inc of Sandusky, Ohio. I just looked over this long thread and I see that many of the links have expired. Gordon, I just received one of these fake renewal notices in the mail with a return address in Reno, NV. It was sent to my new address, which means they got the information from F&SF in the last six monthes. On May 16, I posted about Publishers Periodical Service in Las Vegas. Today I saw a form from a company called Publishers Billing Association at the same Flamingo Road address as PPS. These deceptive notices continue to go out to our subscribers. Please don't be deceived by them. On 8-5-08 I rcd 2 invoices from Publishers Distribution Services, Inc in Brea,CA telling me to immediately pay the two (2) invoices in order to continue receiving my F & SF subscription. On 8-6-08 I emailed F & SF and let them know. They gave me this web site so I could tell you, I filed a formal complaint with the CA Atty General's office. These people are cretins. Does anyone think that it would be evil after calling or sending a letter to these people to ask them to stop sending their junk to me and still receiving the "invoices" to do the following? Aside from the fact that I *do* think it would be wrong to send bricks to these rogue agents, I have to point out that the agents are aware of this familiar ploy and they don't use business reply envelopes. If you wanted to send them something inappropriate, you'd need to pay the cost of postage yourself. Today I heard from a longtime F&SF subscriber who saw our notice in the September issue, got concerned that her renewal must have gone to the wrong company, and stopped payment on it. Problem was, there was no problem with her renewal. Until her check was returned to us, that is. Now she's out the cost of various bank charges simply because she was concerned and wanted to do right in renewing with us. My point in posting this anecdote is simply to say that you can check with us if you're worried about your subscription. Use the "Contact Us" form on our Website or use the phone/fax number here: http://www.sfsite.com/fsf/backish.htm. We heard this week from someone who was deceived by a subscription offer, sent in money, and then got a notice that the subscription wasn't being honored and the company would give the customer credit. If this has happened to you and you would prefer a refund instead of credit, please contact us through our Website. 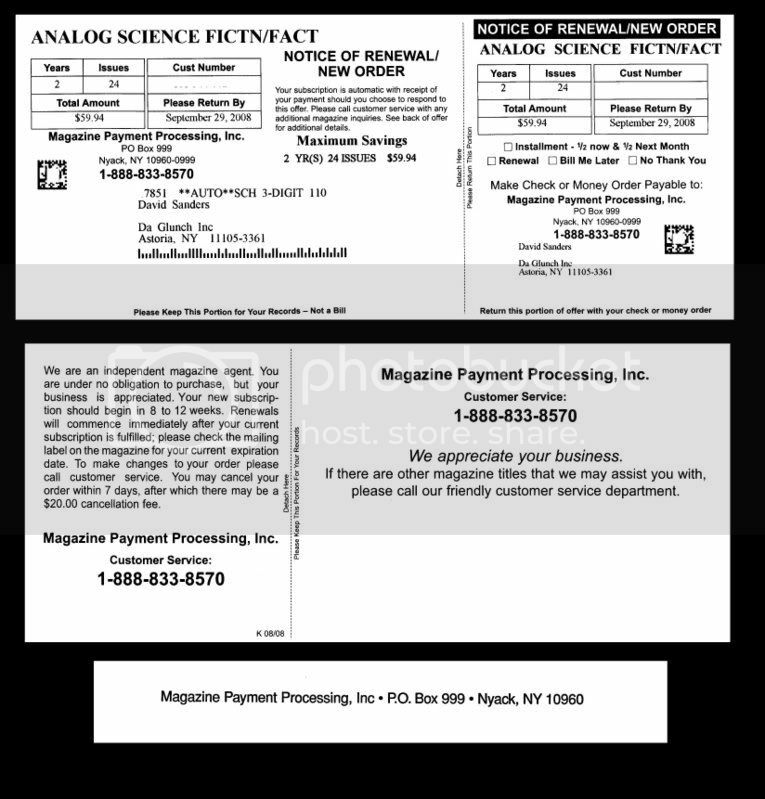 Just received a faux renewal for Analog from Magazine Payment Processing Inc., PO Box 999, Nyack, NY 10960-0999. Customer Service 1-888-833-8570. Same scam. It is the first time I have received one with an East Coast address. OOPS it isn't the first atfer all, I forgot about the elmsford one. I often wonder if these people are operating out of big offices or out of their homes. They seem to be spread far and wide across the country. Thanks for posting, Nameless City. My guess is that a lot of these companies operate out of Nevada and California because some laws there are good for supporting small corporations. I'm not familiar with Magazine Payment Processing, but if you feel they've sent you a deceptive offer, I can recommend some more steps besides filing a complaint with the BBB. Contact me through the F&SF Website if you'd like to hear my suggestions. I'm getting more reports of solicitations from Publishers Distribution Services in Brea, California, so I thought I'd better bump up this thread. If you get one of these notices, please don't let it deceive you into thinking your sub is about to expire. Check the expiration date on your mailing label.